After a long hard day of work, everyone needs a place of their own to relax and unwind. 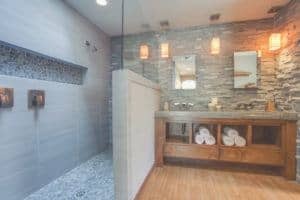 Creating a spa bathroom could be the key to having a private oasis in your own home. It only takes a few touches here and there to transform your bathroom into something amazing. Use these tips to create a spa bathroom oasis in your home. Calm your senses with the scent of something soothing. Whether you choose incense, candles, or oils, your favorite scent is sure to engulf you in a sea of relaxation. Choose calming and relaxing scents like lavender and vanilla, or invigorating scents like peppermint and lemon to refresh and renew your mind. Make your feet happy with thick, fluffy bath rugs. The sensation of walking on a cloud will make you feel light and airy. Don’t forget to update your worn towels as well. Choose towels that are of a quality material like Egyptian cotton. The next time you step out of hot shower, you will feel the difference as you wrap yourself in the luxurious softness. If there is seating in your bathroom, add decorative pillows to further diversify the textures in your bathroom. If you work in an office with bright, fluorescent lighting, your eyes could probably use a break. Dim the lights in your bathroom by installing a dimmer switch or placing a small lamp in the bathroom. If you’re choosing new fixtures entirely, consider getting soft lights to bring a spa retreat feeling to your space. Lighting candles is another great way to create a cozy, calming atmosphere. Scatter them throughout the bathroom to create a tranquil environment. There is something about dim lights that makes you relax, forget your troubles, and focus on the moment. from reach, and create a small cubby space for your slippers. To make things a little more personalized, consider getting your robes monogrammed and customized. 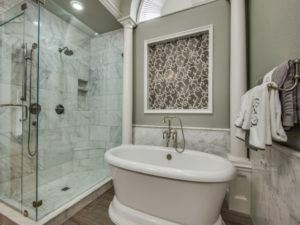 Keep other accessories like bath pillows or caps on hand to make your spa space even more flexible and efficient. To give your bath that spa feel, stock your space with high quality bath products like bubbles, bath salts, bath bombs and oils. Consider scents like vanilla or lavender to maintain the relaxing feeling. Having bath products to add to your bath routine will help give you that resort spa feel right in your own home. Place glasses and bottles of water in your bathroom to add a resort-like feel. If you take a long soak in the tub, you may get a little thirsty. Have something cool and refreshing nearby. Consider adding lemon or cucumber to your water to make you feel like you’re relaxing in a high-end luxury spa. Chances are, you spend a lot of time in the bathroom every day. So why not add a little scenery? Artwork is a great way to bring the theme of your bathroom full circle. You can opt for one large piece or an assortment of small pictures to adorn a wall of your bathroom. If you really want to create a focal point, consider adding a fireplace. Double-sided fireplaces can be enjoyed from both your bedroom and your bathroom, and add the element of warmth to your space. There’s nothing like the enchanting view of flames burning to intrigue and ease your mind all at the same time. Implementing plants and greenery is a great and easy way to take the look of any room to the next level. Greenery helps add just a little more depth to the space. What a lot of people don’t realize is that it can help filter and cleanse the air in your bathroom, which allows you to breathe easier. You don’t need a large array of plants to be effective. A small arrangement in a vase or pot will do the trick. Adding greenery to your bathroom immediately brings life into your space, which is a great element to have when trying to create a relaxing spa environment. It’s hard to relax in a sea of clutter and dirt. Set up your bathroom to be organized. Keep an assortment of baskets filled with bathroom staples to make the bathroom seem more open and neat. Tuck the baskets away in the vanity to clear the visual clutter, but still keep everything organized and ready when you need it. Keep cleaning supplies like sprays, brushes and sponges in a basket underneath the sink so they are hidden but easy to get to. Consider creating and setting a cleaning schedule to ensure that your bathroom gets thoroughly cleaned on a regular basis. 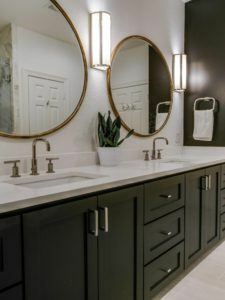 For more helpful tips on how to clean your bathroom, check out this article and checklist from Homeviable! Now that you know know how to create the perfect spa bathroom, where will you begin? Are you looking to renovate your bathroom and create your very own spa oasis at home? Let us help you!